Dell has introduced the XPS 13 to India within a month of debuting it at CES 2018. Dell has introduced the enhanced Dell XPS 13 in India. The silica aerogel used for thermal insulation is used in spacecraft, including Mars rovers. The white colour variant uses a new woven fiberglass material, with a titanium oxide coating to make sure the pristine white colouring does not stain or turn yellow over time. The laptop comes with Windows 10 and Microsoft Office pre-installed, so it is ready to go out of the box. Onboard software prioritises video streaming, and blocks background updates when a video streaming application is running. The Dell Mobile connect application allows you to access your smartphone, pick up calls, respond to texts, or even book cabs through the computer, even if the phone is in your pocket or your bag. The XPS 13 ins incredibly slim, and tapers from a thickness of 11.6mm down to 7.8mm at its slimmest. Despite that, the battery lasts up to 19 hours and 46 minutes while using basic applications. Dell in India, ended 2017 on a high note, after introducing its thin and light Inspiron family of products. Today, in the finale of this series of announcements, Dell has launched the smallest 13-inch laptop in the world, the latest XPS 13 (9370). 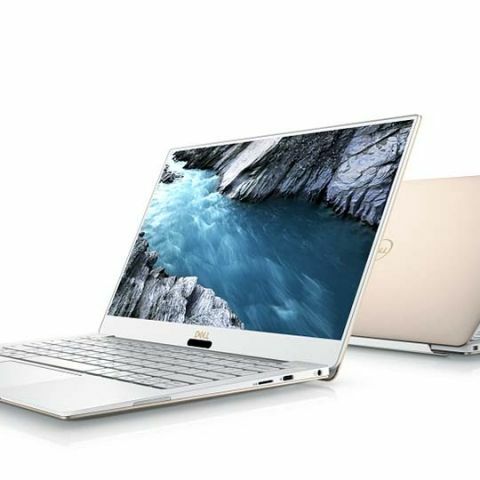 Seeing technology as an expression of style for users and a desire from fashion forward customers to blend technology into their lifestyle, the new XPS 13 is a perfect fit to the growing portfolio. With a robust configuration, unrivaled cinematic experience and eye-pleasing aesthetics, the XPS 13 addresses the need for stylish and powerful machines that deliver quality content on the go. Dell identifies an opportunity for thinner, lighter and more powerful mobile devices that both enthusiasts and professionals demand. Thriving on the philosophy of design-centric premium PCs, Dell’ complete thin and light portfolio is the consequence of leveraging this insight; and the XPS 13 will create a market opportunity appealing to the tech savvy, style conscious consumers, who do not want to compromise on performance. “A Digital India and a growing community of digitized Indians, presents an attractive market opportunity for us as a global PC company. We have a clear vision to introduce a PC for every user. With the discerning demographic of entrepreneurs, CXO’s, mobile workforce and next-generation Indians, we see an exponential growth opportunity for our premium, thin & light portfolio. Our new range will redefine personal computing and give people experiences they want – and some they’ve never dreamt possible”, said Mr. P. Krishnakumar, Senior Vice President & General Manager, Consumer & Small Business, Dell India. Further, to the complete availability of Dell’s thin and light series, with the introduction of Dell Cinema, now more than ever, people can watch video content on their PCs with the expectation of a full cinematic experience, including studio sound and visual quality. Through Dell Cinema, an immersive three-pronged multi-sensory cinematic experience that’s unforgettably real with rich colors, uninterrupted streaming and exceptional audio. The XPS 13 delivers more performance with Dell Power Manager. The user-selectable modes provided by Dell Power Manager allow you to customize the power of the system. This solution, engineered by Dell, dynamically delivers the maximum amount of power from your processor, while intelligently monitoring and managing system temperatures. It only delivers the extra power when applications need it, conserving battery life. It’s also the first laptop built with GORE Thermal Insulation, which provides thermal conductivity levels lower than air in a thin, flexible format, keeping your laptop cool while it works hard. This insulation directs heat out of the device, lowering the temperature and enabling greater performance.